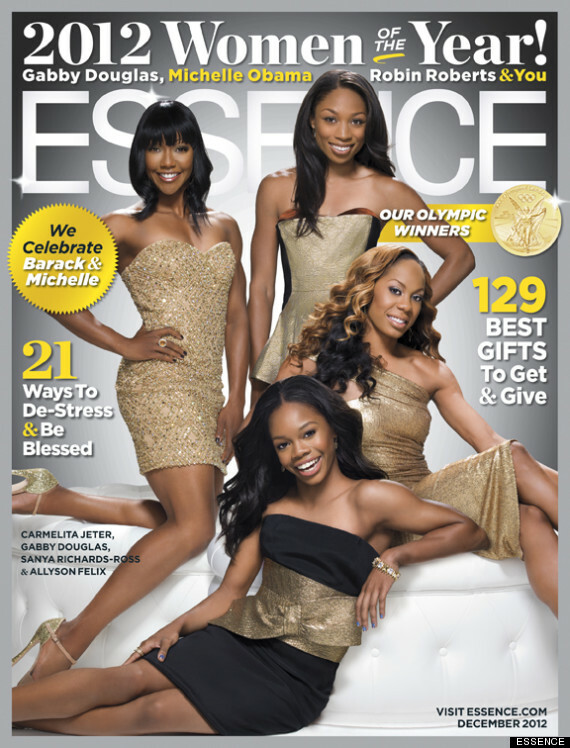 Gold Medalists (L-R) Carmelita Jeter, Allyson Felix, Sanya Richards-Ross and Gabby Douglas all beautiful black women grace the cover of Essence Magazine. Black Beauty at it's finest to say the least! 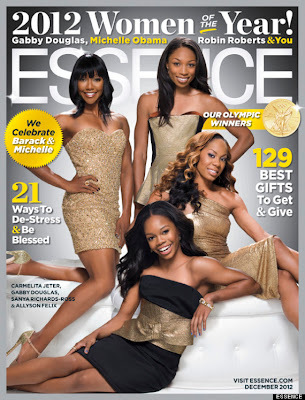 The Olympic winners who all divided and conquered at London 2012 who are glowing in gold, are all being honoured by Essence magazine as Women of the Year alongside other big names such as Michelle Obama and Good Morning America's newscaster - Robin Roberts. Carmelita Jeter - The athlete received 3 medals (Gold, Silver and Bronze) in both 100 and 200 meter races during the London Olympics 2012. Being the only athlete to have a medal in both races. Allyson Felix - Felix left London with 3 Gold medals to her name. With 1 individual medal in the Women's 200 meter race and 1 in the 4x100 meter race alongside her teammate - Carmelita Jeter. Felix also received another medal alongside Sanya Richards-Ross in the 4x400 meter relay. Sanya Richards Ross - The Jamaican/American athlete made her name known when she received 2 gold medals - 1 in the 400 meter race and the other in the 4x400 meter relay. Gabby Douglas - The youngest of them all, at just 16 years old, Gabby Douglas left London with 2 Gold medals. Both of them for her gymnastics in women's artistic individual all-around and in women's artistic team all-around. Gabby and her teammates - Jordyn Wieber, Aly Raisman, Kyla Ross and McKayla Maroney. With all of them being just under 18. WINNING!!! Congrats to all these women being honoured and for doing well during the Olympics - London 2012. And for bringing home the Gold!